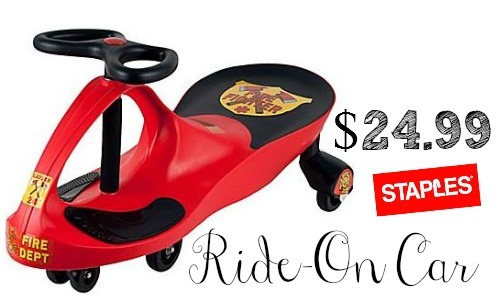 Head to Staples.com to get the Lil’ Rider Wiggle Ride-On Car for $24.99, regularly $69.99! You can choose from several different colors and themes. This ride-on car is very easy and simple to operate making it ideal for children of age 2-6 years old. Also, if you’re a Staples Rewards Member (it’s FREE to sign-up) you can get an extra 2%-5% cash back plus FREE Shipping. If you aren’t a member, you can also have it shipped to your local store for FREE pick-up. Offer valid for a limited time.